This is a strange time for the promoters of apocalyptic global warming – oops, they now prefer “climate change” since the Earth hasn’t been warming for a while – to assail skeptics (like me) as Sun columnist Tom Schaller did this week. (See “Climate skeptics are denying facts, not ‘theories'” on this page Jan 5.) He says “deniers” are caught up in absurdities and self-delusions. It’s weird timing because, much to the dismay of the believers that man-made greenhouse gas emissions are causing what will quickly be cataclysmic warming that must be thwarted by any means possible (even though there is really nothing that can effectively reverse such a climate change if it is under way), the reality is we are in the grip of exceedingly cold temperatures throughout most of the Northern Hemisphere. This is the so-called Gore Effect in hyper-overdrive. 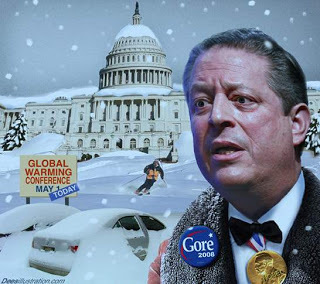 The Gore Effect is the phenomenon of chilly weather, up to and including blizzards, uncannily striking an area either shortly before, during or shortly after the former vice president makes an appearance there to drone on before enthusiastic true believers about how the “Earth has a fever” and all that rot. This is just a brief sampling of such headlines. It could easily continue through the rest of my allotted space here. The point is we are not warming, we are now cooling – which in the absurd thinking of die-hard alarmists means global warming is the cause of this abnormal cooling. The assertion of such nonsense in the face of what can be seen and felt by normal human beings no doubt helps stoke the palpable lack of interest they now have in the issue. The BBC managed, for example, to have five of its correspondents speculate on the important things the world faces in 2010, and there was a single, buried mention of climate matters. This would have been unthinkable just a few months ago. Professor Schaller dismisses the importance of the leaked e-mails from the Climatic Research Unit at the University of East Anglia in the U.K. that revealed the efforts of leading climate-alarmist scientists to fiddle with data and stifle dissenting peer opinions (the Climategate scandal) saying deniers are misrepresenting the e-mails, which show nothing more than “a legitimate disagreement among scientists.” Most of Big Media would agree with that, having fervently embraced the global warming religion. On this newspaper’s editorial page, we often read predictions of impending calamity unless we adopt the prescriptions of the alarmists, massively taxing carbon emissions, drastically curtailing the use of fossil fuels and otherwise shackling our already troubled world economy to address global warming, uh, climate change. Most people aren’t very much aware that climate changes naturally, sometimes quite drastically. What the well-funded proponents of climate alarmism have found most helpful is that the people can therefore be persuaded that natural change is actually unnatural and is caused by human activity. So here we are, plagued by a severe winter, much like the ones in the 1970s that helped an earlier generation of alarmist scientists peddle the doomsday scenario of an impending ice age. I do believe there’s a greater danger to humanity from that possibility than from any warming trend. Bundle up.